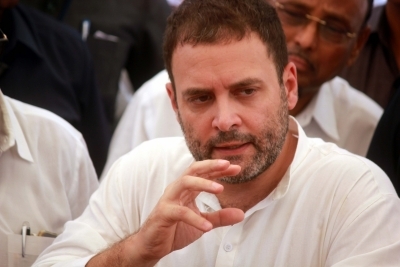 New Delhi, Oct 25 (IANS) Congress Vice President Rahul Gandhi on Wednesday again mocked the government over its growth forecast, terming as a “farce” the Modi government’s statements on its economic performance. Attaching a tweet posted on Tuesday by the Press Information Bureau, the government’s official publicity wing, which said that real GDP growth average was 7.5 per cent in the last three years, Rahul Gandhi posted: “Dear Mr. Jaitley, May the Farce be with you.” His remark was also a pun on the famous line from the “Star Wars” blockbuster movie series. The table accompanying the PIB tweet said “IMF Forecast” said that 8.2 per cent growth was achieved in 2015-16, temporary economic slowdown was bottoming out and the GDP was projected to grow much faster in the times to come. Finance Minister Arun Jaitley had on Tuesday said the Indian economy is on a strong wicket and expressed confidence in its macroeconomic fundamentals. He had also maintained that India has been the fastest growing major economy for the last three years and the government is attempting to maintain a high growth rate.